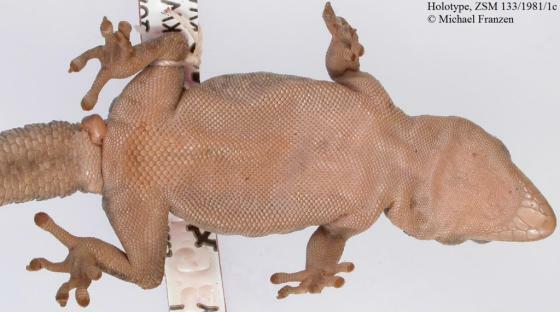 Can you confirm these amateur observations of Tarentola raziana? Diagnosis Diagnosis (raziana): Smallest Cape Verdean wall-gecko (maximum SVL <60 mm, on average 49.3 mm; Appen- dix 2), eye/ear opening ratio > 2 (Schleich, 1987); ear– eye/eye–snout distance ratio clearly ≤ 1 (Schleich, 1987). Nine to 11 supralabials (often ten) and seven to nine infralabials (often eight or nine) (Schleich, 1987); seven to ten enlarged lamellae under the 4th finger; 116–156 midbody scales (Joger, 1984b); oval to round conical and saddle-like more-or-less keeled dorsal tubercles (Fig. 5B2) with 16–18 longitudinal lines (Schleich, 1987); no tubercles between the eye and the ear opening. Snout particularly pointed and forehead concave. Dorsal pattern with only three (sometimes four) symmetrical butterfly- or X-shaped broad dark dorsal crossbands often lined with whitish tubercles posteriorly (Figs 6B2, 7B2); light grey or beige to dark brown olive dorsal parts and cream to yellowish ventral parts; generally white labials; eye iris dark golden with a broad black horizontal band. Besides its smaller size, it has narrower fingers, smaller number of lamellae under the first toe, and smaller number of gular scales than other Tarentola from clade B (Joger, 1984b); usually only three dorsal transverse bands (Joger, 1984b). MORPHOBANK M44995–M44500, M55699–M55714 [VASCONCELOS et al. 2012]. Comment Synonymy after Filipe Sousa (pers. comm.) and VASCONCELOS et al. 2012.